Behind its unassuming "stealth black" exterior, the Paul Reed Smith Archon 50 combo guitar amplifier is a beast in the studio, with switchable power settings for 25 watts or 50 watts worth of alluring tube tone. Six 12AX7 preamp tubes and your choice of two 6L6 or two EL34 power tubes keep your signal warm as it makes its way through this combo amp's 12" Celestion G12-75T speaker. Partitioned volume and bass, middle, and treble controls allow you to keep each channel independently sounding awesome, and master depth and presence controls help you keep all the tonal dimensions of your guitar's output intact and under control. The output on this amp features switchable 4/8/16 ohm settings, which gives you more options for your choice of cabinets. Fire up your PRS Archon Combo Stealth amp and hear your signal as it was meant to be heard. With six 12AX7 preamp tubes and two power tubes, your axe gets a warm and modern punch that sounds amazing clean or distorted. You have the option of working with either 25 watts or 50 watts. When you slip into lower wattage settings with tube amplifiers, you can still get those hair-raising high-gain sounds, but with some cool, classic, and sensitive response that amps with higher wattages can't quite produce. Personalize your Archon 50 with the tubes you prefer. 6L6 tubes are notable for their flexibility -- they'll stay smoother longer, giving you just a hint of creamy breakup, whereas EL34 tubes run hotter and distort earlier, giving you a wider range of overdriven tones. Pick your poison with this PRS amp. As any session guitarist can tell you, it helps to have your settings for each channel separate. Sometimes you want less low-end mud and a push in the treble for edgier leads without losing any of the depth or warmth when switching back to your clean channel. Separate volume controls also allow you to push the decibels a little more for your lead channel without the need for a volume pedal. The 12" Celestion G12-75T speaker keeps your output clear, balanced, and well-articulated through every note and every chord. On the right side of the Archon 50 combo amp's front panel are presence and depth controls. A presence control works as a low-pass filter, allowing you to control the amount of the higher frequencies that are fed back after the input gain stages. If you want more edge, then crank this dial up. The depth control modifies the amount of low-end produced in the feedback network. Play around with this control to see how tight or how much "wuff" you want to your sound to get in the lower frequencies. - Combo Dimensions: (L x W x D) 21.5 x 10.5 x 17.75"
The PRS Paul Reed Smith Archon 50 1x12 Combo continues the Archon's promise of delivering full, lush gain while offering a clean channel that players of all genres will appreciate. With 50 watts, switchable to 25 via the amp's back panel, the Archon 50 breaks up at a lower volume, resulting in a more classically driven tone than its 100 Watt predecessor. The added option of 6L6 or EL34 power tubes allows players to further personalize the tone and feel of the Archon 50. 6L6 tubes offer plenty of versatility and warmer, more balanced tone across the full range of frequencies. They will also push with less saturation for a bit of a sweeter, smoother tone. EL34 tubes offer focused, tight, punchy gain. They run a little hotter, distort earlier, and deliver a wider range of overdriven, crunch tones that are great for rock distortion. 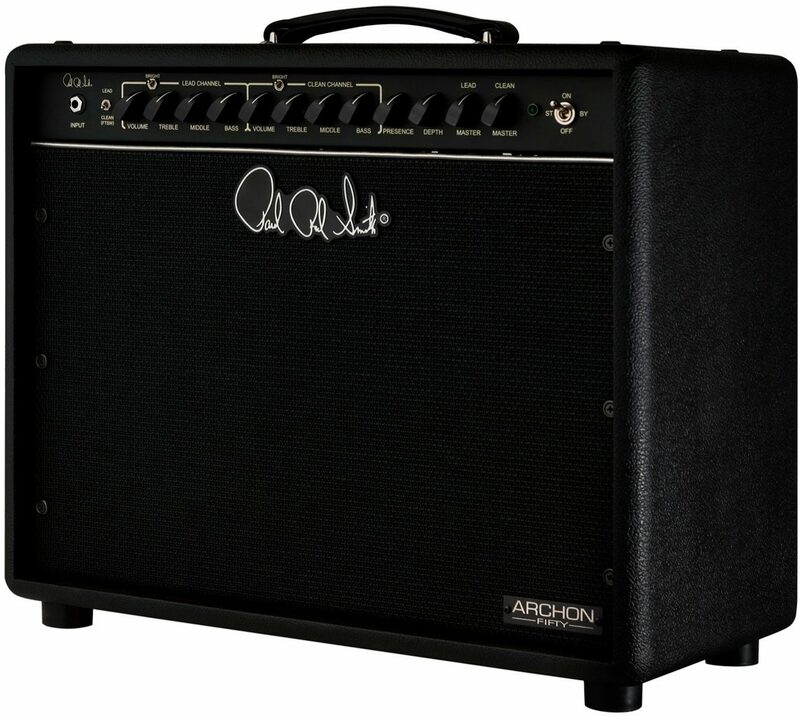 The Archon 50 can back players from metal to rock to country to blues. "Best High Gain Amp Out There"
Overall: The Archon 50 is the best high gain amp for the money. It does two things exceedingly well: a high gain tone and a squeaky clean tone. The only thing missing is reverb, but that can easily be added with a pedal through the effects loop. What distinguishes the Archon from Marshall and Mesa Boogie, in particular, is the way it is built. Marshall and Mesa Boogie use all PCB construction with the tubes, sockets and switches mounted right to the PCB. The Archon is hand wired, so you can change tubes without worrying about cracking the PCB, and, if anything ever goes wrong, you can have someone actually work on the amp.